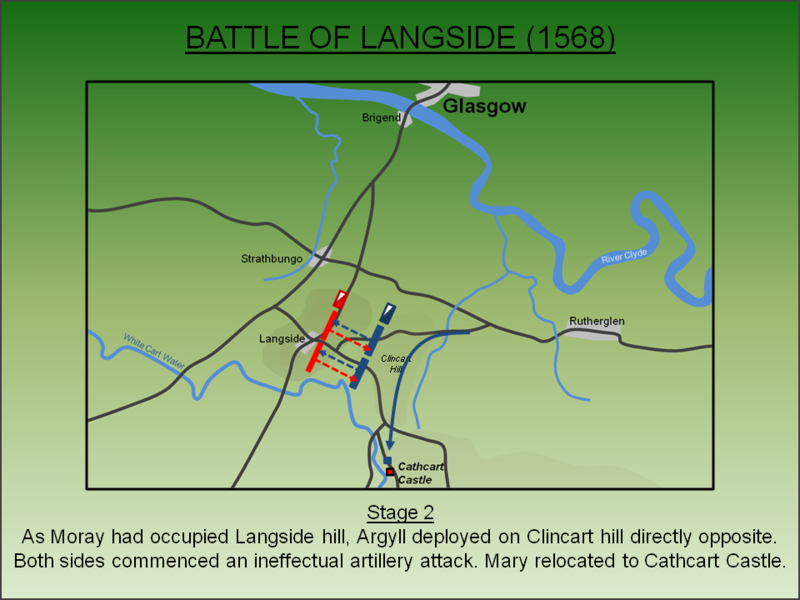 At the Battle of Langside (1568) the Catholic Mary, Queen of Scots was decisively defeated by Protestant forces after which she fled to England where she was incarcerated by Elizabeth I and eventually executed. More significantly, the battle led to entrenchment of the Presbyterian church which would have significant consequences almost a century later during the Wars of Three Kingdoms. Mary became Queen of Scotland in December 1542 when she was just six days old. However, her minority was plagued by factional infighting as well as war with England. In 1548, to ensure her safety from a forced marriage with Edward VI, she was sent to France where in April 1558 she married the future Francis II. He succeeded to the throne the following year and Mary became Queen of France but his reign was short as he died in December 1560. Mary, who was on the cusp of turning 18 years old and felt alienated in the new French regime, decided to return to Scotland to fill the void left by the death of her mother, Mary of Guise. However, Scotland was a country in religious turmoil because in August 1560 Parliament had abolished the Roman Catholic faith across the Kingdom. Mary arrived back in Scotland on 19 August 1561 and attempted to steer a path of toleration between the two religious factions. She partially recognised the new Scottish Presbyterian church but concurrently remained resolutely Roman Catholic herself and also attempted to arrange a marriage alliance with Spain, the bastion of Catholicism. The latter came to nothing and instead Mary opted to marry Henry Stuart (Stewart), Lord Darnley. Although a Protestant, the union was not a success and the two became estranged. When Mary had their son, James (later James VI of Scotland and James I of England), christened as a Catholic fears began to grow amongst the Protestant magnates. Matters came to a head in February 1567 when Darnley was murdered. The pro-Catholic Earls of Argyll, Bothwell and Huntly devised a plan to assassinate Darnley at Craigmillar Castle near Edinburgh. Perhaps sensing danger, he opted to stay in his town house within the city itself but, on the night of 9 February 1567, this was destroyed in a gunpowder explosion. Darnley survived the blast but was found strangled outside the burning building. The connivance of the Queen was suspected and these rumours were only fuelled when Mary married one of the leading conspirators - James Hepburn, Earl of Bothwell - in May 1567. The Protestant magnates rose up in rebellion against the Queen and gathered their forces. The two factions met at Carberry Hill on 15 June 1567 and, when Bothwell's troops refused to fight, Mary surrendered to her opponents. Mary was imprisoned in Lochleven Castle, an island fortress, where she was forced to abdicate in favour of her infant son, James. He was quickly crowned at Stirling but effective control of the country passed into the hands of the Regent - James Stewart, Earl of Moray. 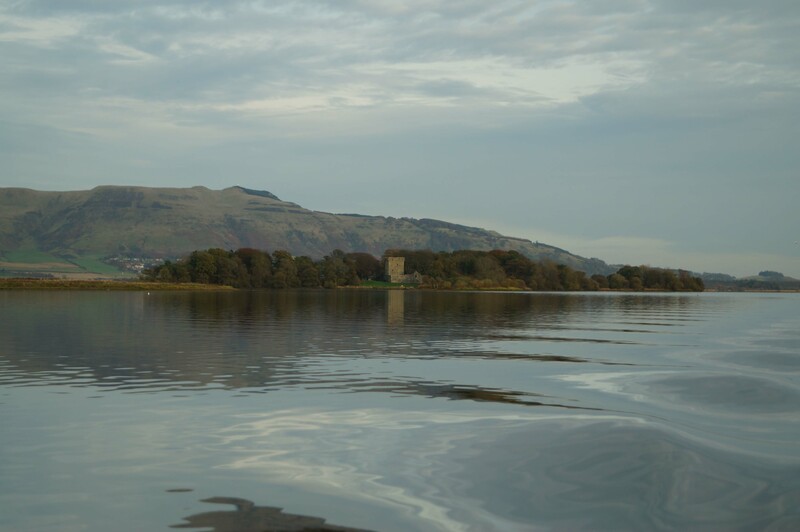 Meanwhile Mary remained a prisoner at Lochleven for almost ten months but, on the night of 2 May 1568, she escaped with the aid of one of the castle's boatmen, Willie Douglas. She proceeded west gathering her supporters as she went and many flocked to her banner including the Earls of Argyll, Cassillis, Eglinton and Rothes. These followers drew up a bond declaring Moray a traitor and revoking the Queen's abdication which it alleged was made under duress. Despite her growing army, Mary sought to consolidate her support and gather a much larger force before challenging the Regent. Accordingly she marched west heading for Dumbarton Castle whose Governor, John Fleming, had refused to surrender to the Regent during Mary's captivity. From that fortress Mary hoped to raise additional troops from amongst the pro-Catholic highlanders and islanders of the west coast. With Moray in Glasgow, which in the sixteenth century was limited to the northern banks of the River Clyde, Mary opted to give the city a wide berth. She chose to take the road over Langside Hill, some two miles to the south of Glasgow, and then proceed via Crookston Castle to Erskine where she could ford the river and proceed onto Dumbarton. From his base in Glasgow Castle, Moray was well aware he needed to destroy Mary before she could gather further support. He quickly and efficiently mustered what forces he could in the city and moved his assembled army on to Glasgow Moor, just to the east of the town, to await the Queen's approach. His intelligence network soon alerted him to the Queen's intention to stay on the south bank of the River Clyde and evade engagement. Moray wasted no time, moved his army across Glasgow Bridge and raced to intercept. The King's army was under the command of the Regent whilst his deputy and commander of the vanguard was James Douglas, Earl of Morton. The army consisted of troops hastily assembled but included some experienced soldiers - notably William Kirkcaldy of Grange who had led Mary's opponents at Carberry Hill the previous year. Furthermore the Regent's cause was widely supported amongst the Scottish nobility, many of whom had profited from the Reformation not least from the cheap acquisition of former church lands. The Queen's army, whilst nominally headed by the Mary, was under the military command of Archibald Campbell, Earl of Argyll. It included a number of a notable magnates amongst them the Earls of Eglinton, Casselis and Rothes. The battle was fought on the morning of 13 May 1568. The Terrain was largely undeveloped open ground although Langside itself was a small settlement strung along a crossroads. The various properties in the village were divided from each other, and from the road, by thick hedges. Moray, seeing that Mary sought to avoid battle, moved his army back through Glasgow and over the bridge that crossed the River Clyde to the south of the city. Both the armies were now heading for the high ground at Langside Hill. Moray sent a 200 strong mounted detachment ahead of his force under the command of William Kirkcaldy of Grange with each horseman carrying a hagbutter (musketeer) as pillion. This advance guard quickly secured Langside village with the hagbutters being deployed amongst the thick hedges that lined the road from the east. The rest of the army followed after having been speed marched from Glasgow. His army was already in place as Mary's force arrived on Clincart Hill (now known as Mount Florida). Seeing the Regent's forces deployed in battle array, the Marian forces halted their advance. Both sides deployed their artillery. Moray deployed his forces along the high ground with his right flank protected by the scarp down to White Cart Water. 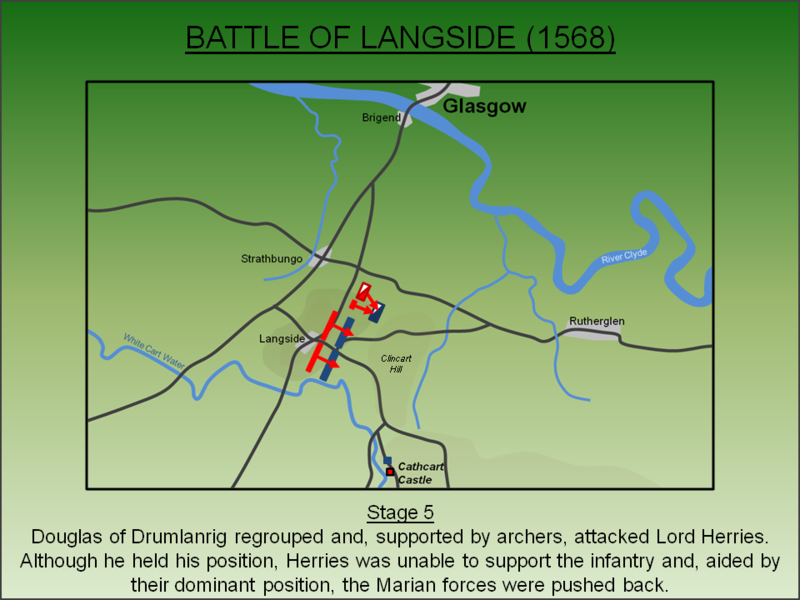 He placed his cavalry, under Douglas of Drumlanrig, on his left flank. Argyll drew up the Marian forces on Clincart Hill. A large scale, but ineffective, artillery exchange followed although neither side suffered significant casualties during the bombardment. The Marian forces focused the brunt of their assault against the forces blocking the road. The Queen herself relocated to Cathcart Castle to view proceedings from safety. As Moray commanded the road west, the onus was on the Marian forces to break the deadlock. 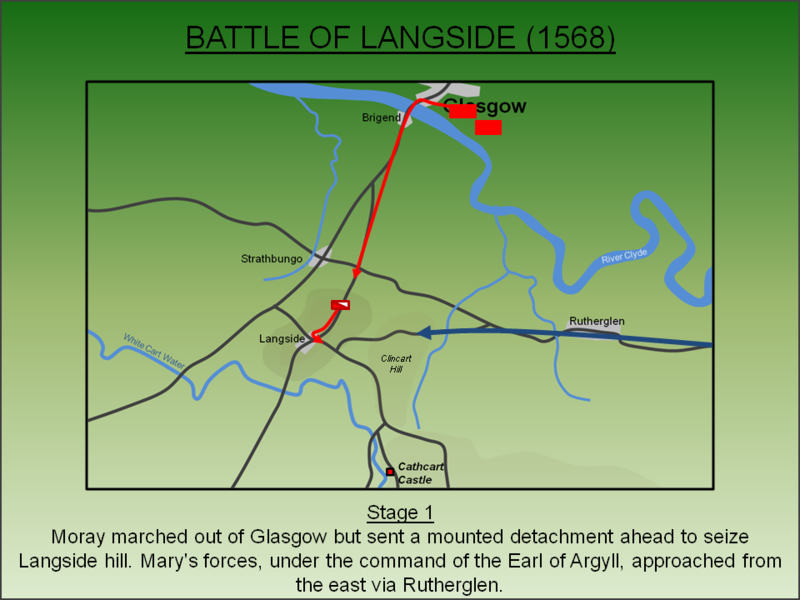 Argyll opted for an unimaginative frontal assault and sent his infantry forward under Lord Hamilton to smash through the Regent's lines and open the route to Dumbarton. Hamilton advanced along ‘Bus’-an’aik’ road (now Battlefield Road) but suffered heavy casualties from the hagbutters enclosed in the hedgerows lining the road. Concurrently Lord Herries led the Marian cavalry to attack the Moray's left flank (in vicinity of Hospital). Hamilton fell back but regrouped and attacked again. Meanwhile Lord Herries was having better luck on the Marian right. Although he had been counter-charged by Douglas of Drumlanrig, he had held off the onslaught and continued to push forward sending the Regent's cavalry back in disarray. Douglas of Drumlanrig regrouped and attacked Lord Herries again this time aided by archers. Lord Herries proved indefatigable and managed to hold his position. However, Douglas had effectively neutralised any support the Royalist cavalry could give to the infantry. 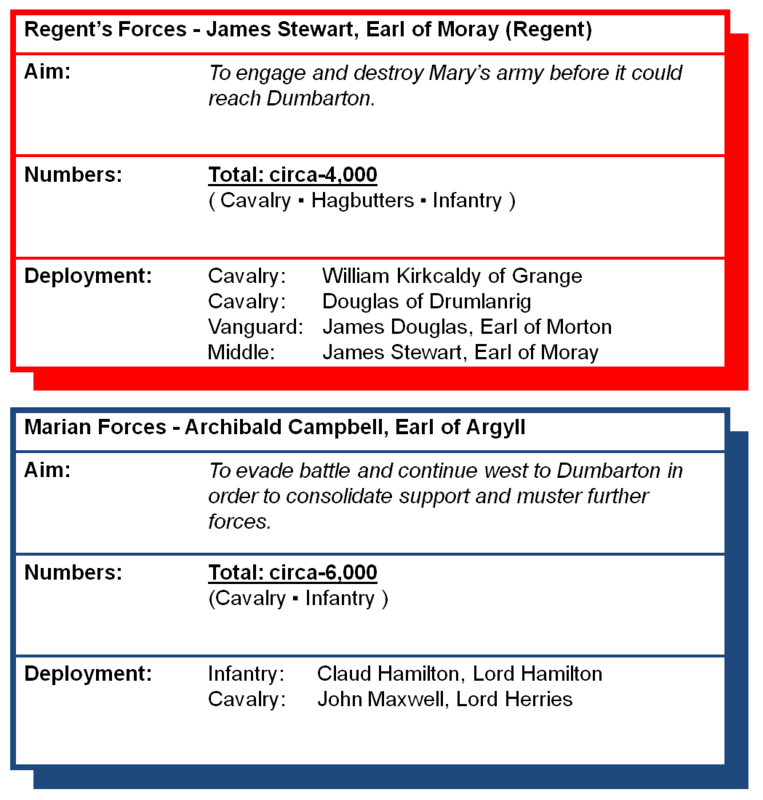 This was not lost on Kirkcaldy of Grange who sent the infantry of the Regent's army forward to engage the Marian infantry. Benefiting from the high ground, the Regent's men fought hard to defeat the Queen's forces. Slowly they pushed them back and a final charge by a force of Highlanders, the MacFarlanes, broke Mary's army into rout. The retreating troops fled back along what is now Battlefield Road with around 300 being killed. However, Moray ordered his men not to pursue doubtless saving many lives. The Earl had little appetite for the unnecessary slaughter of his own countrymen. The battle had lasted less than one hour. With her army destroyed and any chance of dislodging the Regent now gone, Mary fled to England hoping to enlist support from Elizabeth I. However, the English Queen saw the Catholic Mary as a clear and present danger to her own existence. Although Mary was welcomed into Carlisle Castle, as the weeks went on her guest status was subtly modified to one of imprisonment and she was moved ever further south until her participation in the Babington Plot led to her execution at Fotheringhay Castle in February 1587. 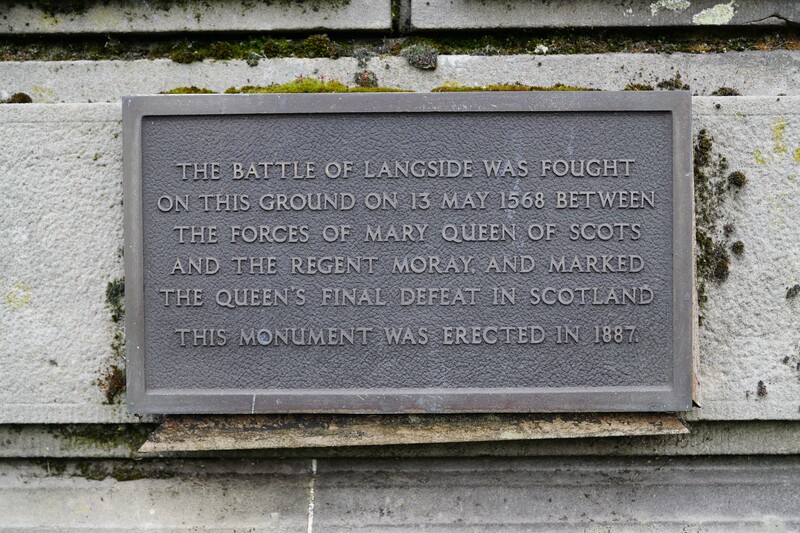 More significantly the defeat of Mary at Langside effectively steered the future direction for religion in Scotland. The young James VI was brought up as a Protestant making him both acceptable to the wider Scottish nobility and also to the English regime who, in 1603, welcomed him as heir to Elizabeth I. From this point on Scotland remained fiercely Protestant - a factor which would have significant consequences for the British Isles as a whole during the Wars of Three Kingdoms. Breeze, D J (2002). People and places: the men, women and places that made Scottish history. Edinburgh. Buchanan, G (1843). Rerum Scoticanum Historia. History of Scotland. Fisher, Son & Co., London. Holinshed, R (1808). Holinshed's Chronicles of England, Scotland, and Ireland. London. Lancaster, J.H.D (2017). 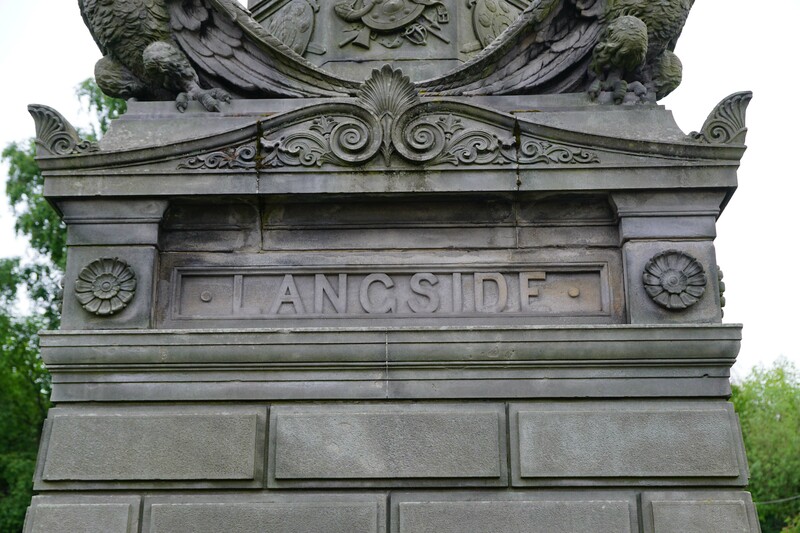 Langside: Battlefield visit notes and observations. CastlesFortsBattles.co.uk. Martin, D. E (1997). The Battlefields of Scotland: A report on their preservation for Historic Scotland. Historic Scotland, Edinburgh. Ordnance Survey (2016). Glasgow City. Ordnance Survey, Southampton. Scott, A.M (1885). 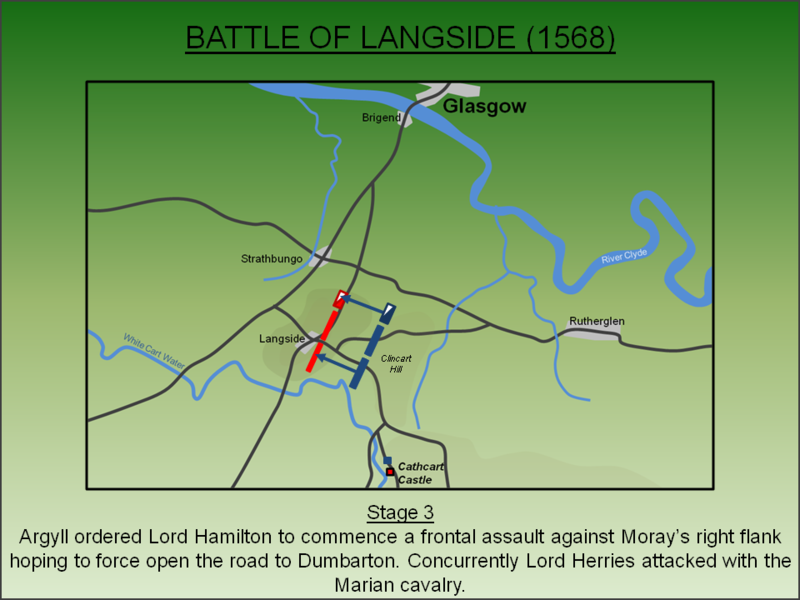 Sketch Map relative to the Battle of Langside. 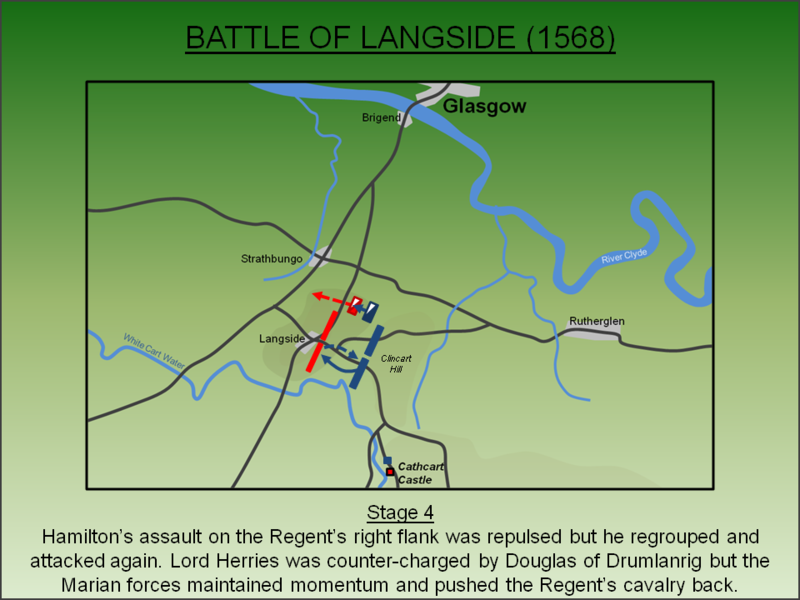 Langside, which at the time of the battle was a small settlement surrounded by open ground, has now been consumed by the urban sprawl of Glasgow and accordingly bears no resemblance to the sixteenth century terrain. 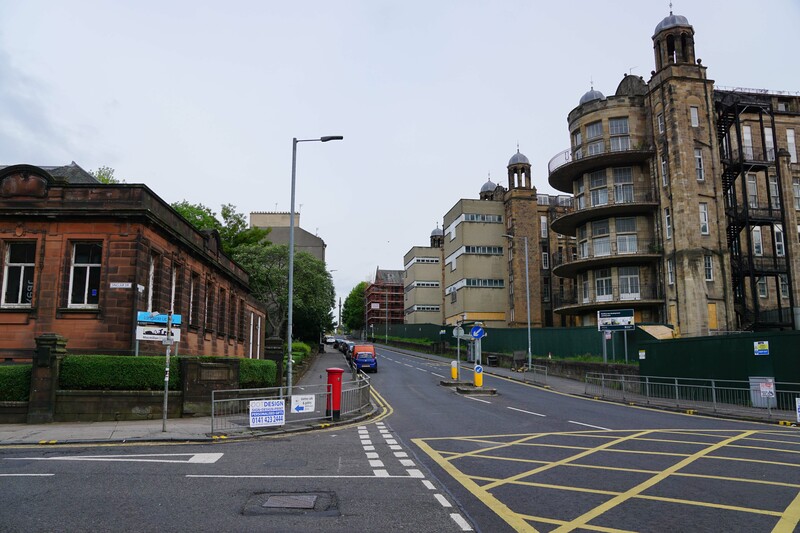 However the general topography, particularly the ascent to Langside Hill, can be appreciated and the viewpoint with Queen's Park gives a hint to the dominating position the hill afforded the Regent. A substantial monument commemorates the battle. Monument. The monument was erected in 1887. It occupies the ground held by the right flank of the Regent's army and marks the focal point of the initial assaults by the Marian forces. The lion on the top faces Clincart Hill where the forces of the Queen deployed. Battlefield Road. This was originally the ‘Bus’-an’aik’ road and, at the time of the battle, was narrower and lined with thick hedges. The hagbutters (musketeers) of the Regent's army used these as cover to attack the Marian forces as they advanced. The bulk of the casualties suffered by Mary's forces occurred on this road. Queen's Park Viewpoint. The northern portion of the battlefield has been landscaped and is now Queen's Park. 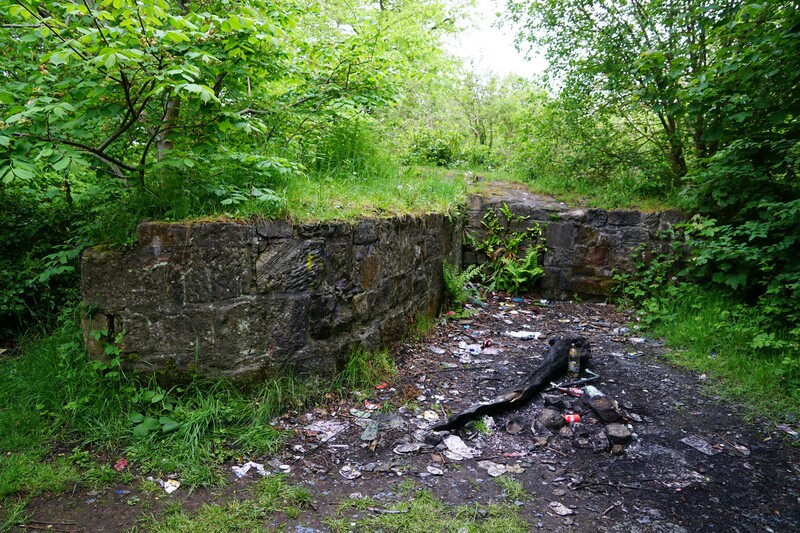 A viewpoint at the summit gives the visitor a clear impression of how Langside Hill dominated the area. 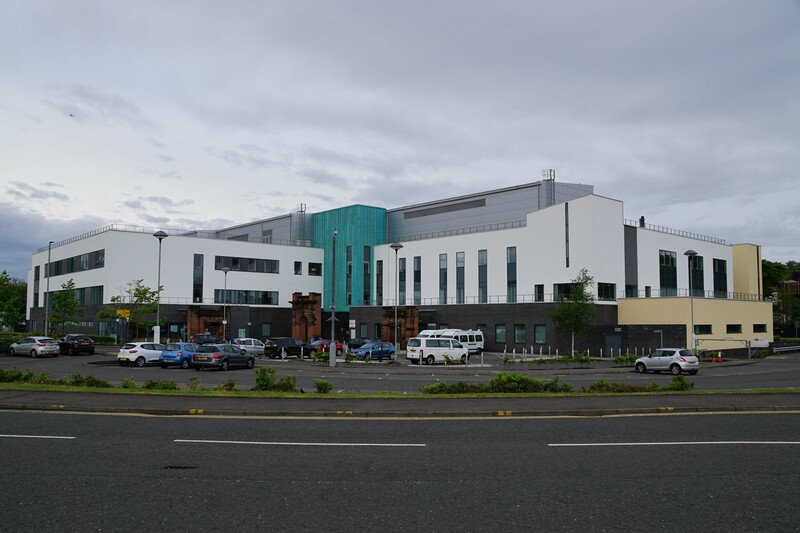 New Victoria Hospital. The cavalry engagement took place in proximity to the land now occupied by the New Victoria Hospital. It was here that Lord Herries and Douglas of Drumlanrig attempted to defeat each other's forces. Queen's Park Boating Lake. 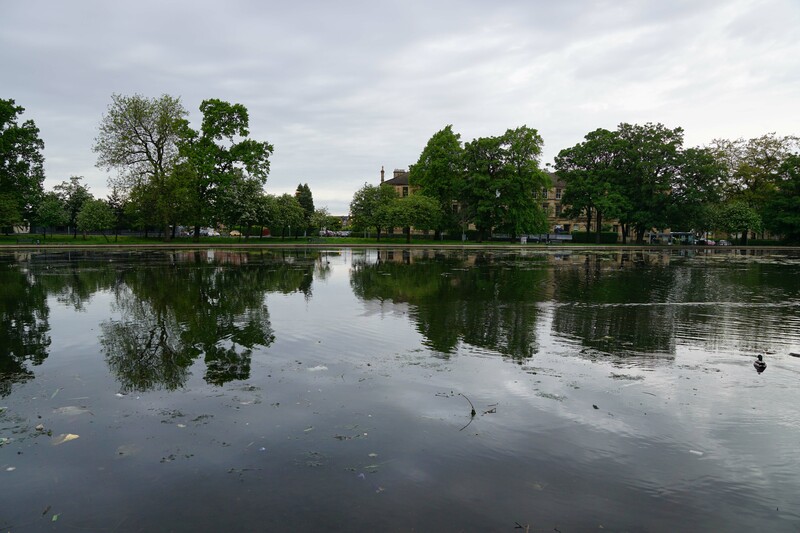 The dead from the battle were allegedly buried in the marshland that was later converted into the Queen's Park pond. However, this is highly unlikely as it would have meant the bodies would have had to be moved from the other side of the hill. Albert Bridge. 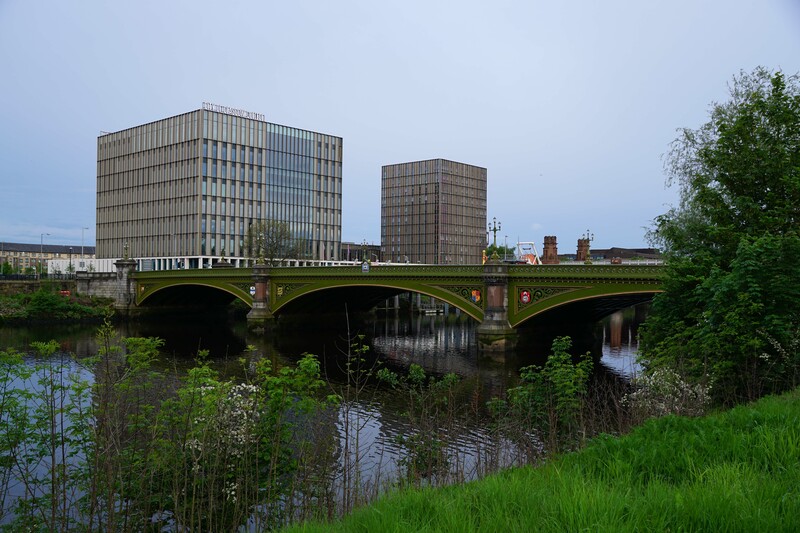 In 1568 Glasgow only had one bridge across the River Clyde which was located on the site currently occupied by the nineteenth century Albert Bridge. It was here that Moray crossed the river in order to proceed to Langside Hill. Glasgow Moor. Moray was unsure where Mary would cross the River Clyde and so mustered his forces on Glasgow Moor, just to the east of the city. 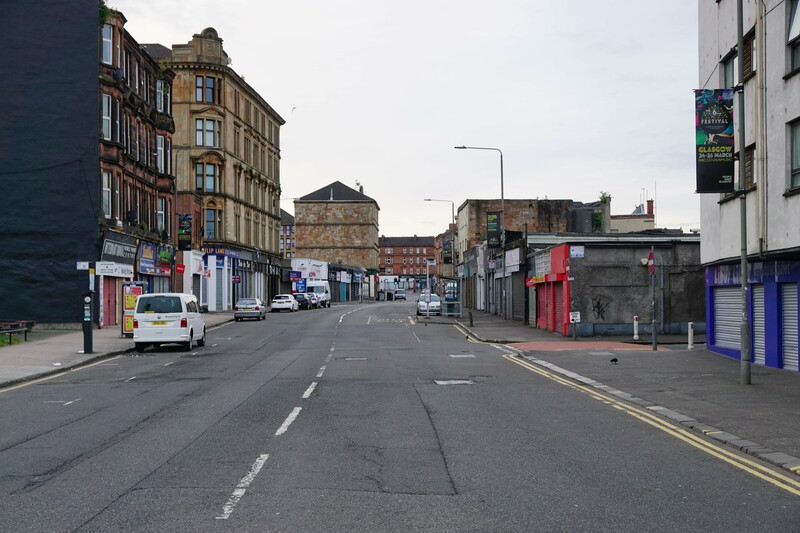 The site has now been buried under the urban sprawl of Glasgow but was located to the east of Gallowgate Road. Court Knowe / Cathcart Castle. As her forces mustered for battle, Mary relocated to the south to watch the battle from relative safety. It is alleged she watched the battle from Court Knowe (left) and the adjacent Cathcart Castle (right). 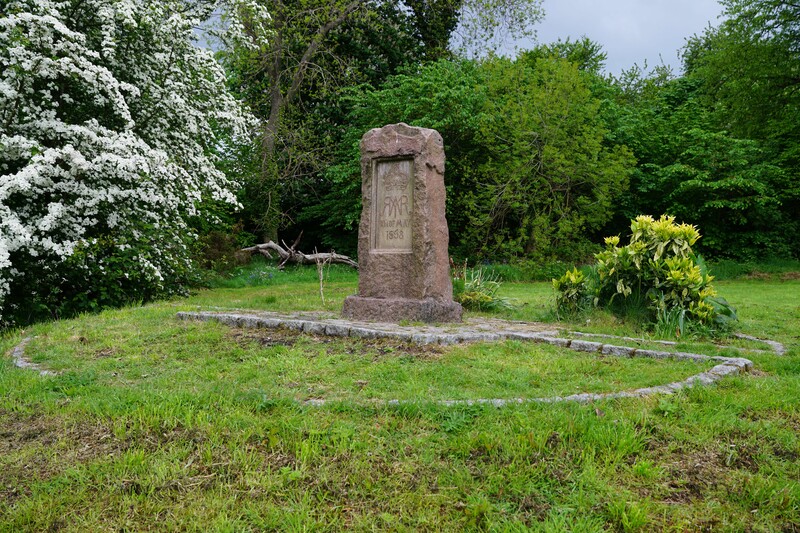 A monument has been erected at the former but only foundations remain of the castle as the rest was demolished by Glasgow City Council in the 1980s. Lochleven Castle. Following her defeat at Carberry Hill, Mary was imprisoned in Lochleven Castle. This island fortress was held by Sir William Douglas but, after ten months, Mary was able to escape and rally her forces. Dumbarton Castle. 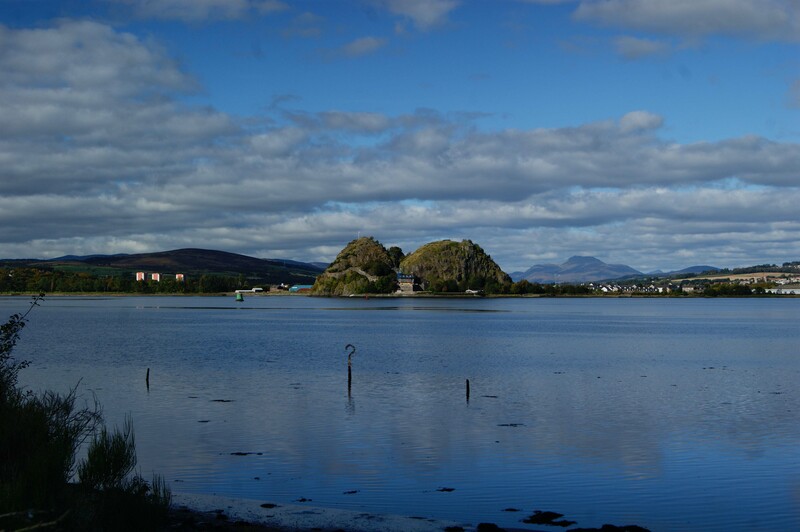 Following her escape from Lochleven, Mary intended to head west towards Dumbarton Castle which had defied the Regent and held out resolutely for her cause. From this stronghold she hoped to rally the pro-Catholic Highlanders and Islanders to her banner. The focal point of any visit should be the monument. 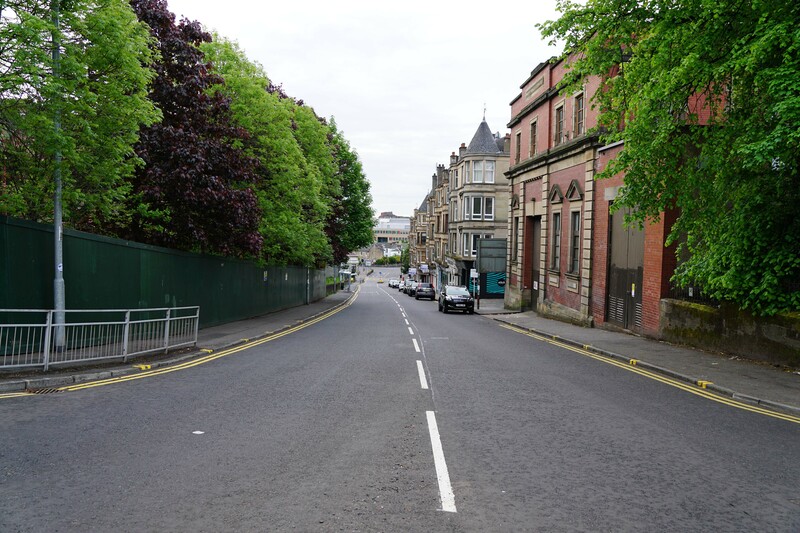 There are various parking options in and around this area including on-road car parking on Algie Street. 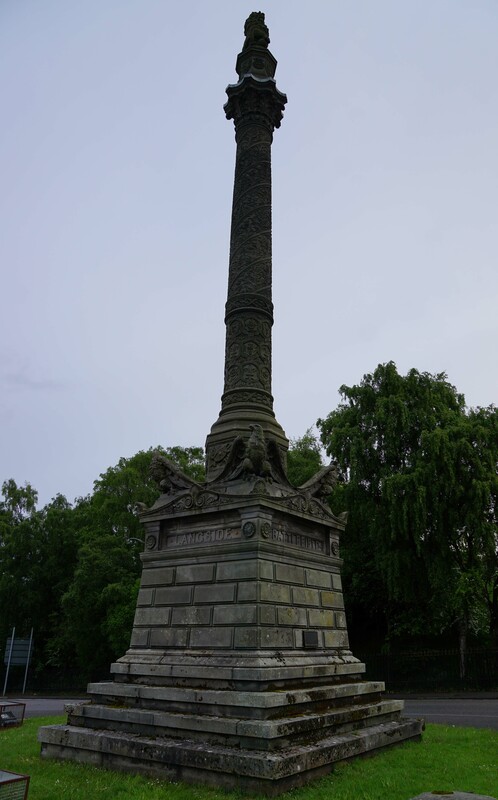 The battlefield area can be explored on foot with the two mile walk shown below encompassing the monument, Battlefield Road, New Victoria Hospital, Queen's Park viewpoint and the boating lake. Court Knowe and Cathcart Castle can be found two miles to the south-east with on-road car parking possible nearby.